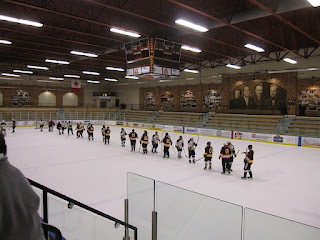 My dad organized a two game age 65 plus "tournament" on Oct 29th & 30th, 2012 to play a team from Minneapolis in Duluth. He got players from his afternoon group, another person's afternoon group, plus a few others for the Thunder Bay team. He was wondering if I had a trophy he could use for the "tournament". I modified one I had previously acquired at a yard sale. 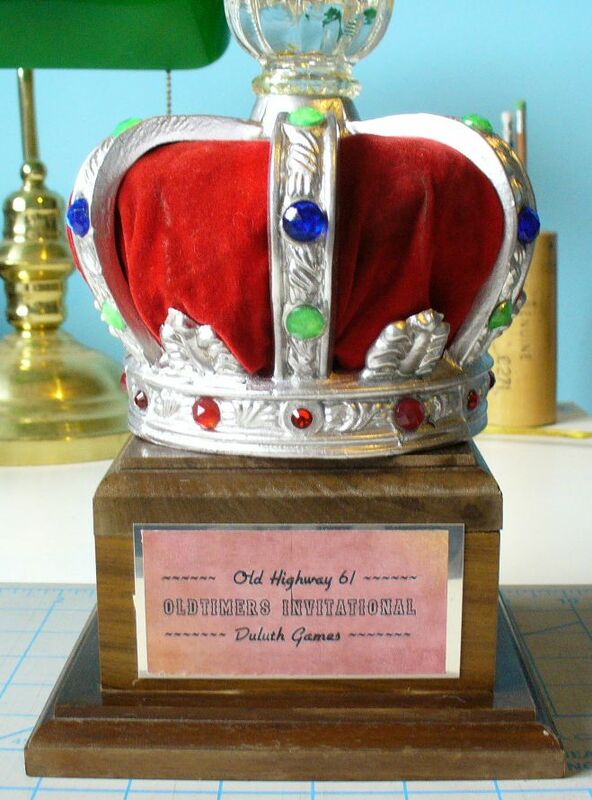 It was originally a Women's bowling trophy. Took the women's bowler figure off the top of the trophy and replaced it with a bolt. Sanded and repainted the crown, washed the red velvet like material and replaced the old newspaper stuffing it with newer paper. Reused some of the 'jewels' that had not fallen off and got some more from the dollar store. 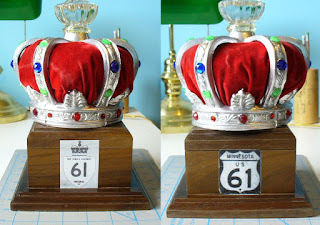 Made a label to stick over the silver coloured engraved area on front and made some stickers of the current (and historic) highway sign on this side of the border (King's Highway 61) and of the old Minnesota Highway 61 that did run through Minneapolis/St. Paul up to the Canadian border (now is broken into U.S. Highway 61, I 35, and State Highway 61). Glued a glass doorknob that had fell off of my spare room door on top of the crown. Here are a couple pics of the front and sides of the finished trophy. As of yet, don't have any action shots of the games or team pics but have a few pics. My dad (on right) with the other team's captain. The teams shaking hands after a game. 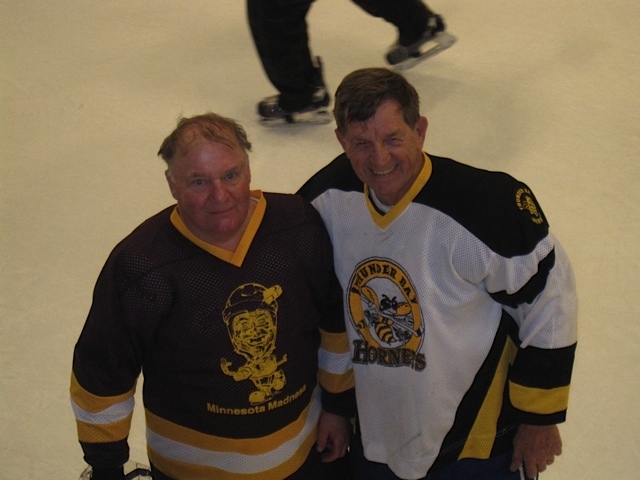 A couple of the players outside the arena (Bob and Walter). Some tailgating in the parking lot. On all accounts the food and hospitality provided by the other team was great.